Adjust your rifle sights to improve your results. 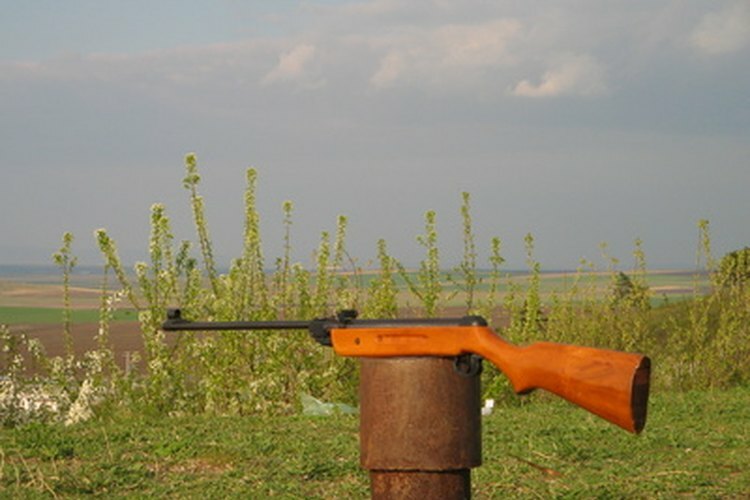 Most rifles come already equipped with a standard sighting device. The rifle sight is an essential component of all rifles as it allows the shooter to make adjustments for increased accuracy. Whether it be for competitive shooting or for hunting, properly adjusting a rifle sight is an easy task that will reward the shooter with increased safety and more bulls-eyes. Set up a target with a bulls-eye about 20 yards away. Your local gun range is the best place to set the sight on a rifle. Rest your rifle on a stable structure that will minimize recoil. Shoot three rounds at the bulls-eye. "The Complete Guide to Hunting" recommends taking your time to realign your sight on the bulls-eye between shots. Retrieve the paper target and take note of the three bullet-hole locations. Establish the what "The Complete Guide to Hunting " calls the "average point of impact." You can be determine the average point of impact by marking an "X" in the center triangle of a three-shot-pattern. Loosen the top screw and move the sight device higher or lower depending on the shot pattern on the target. Slide the sight higher, in small increments, if the "X" is below the bullseye. Slide the device lower if the shot pattern is higher than the bullseye. Loosen the side screw if the "X" is left or right of the target. Move the sight adjustment to the right slightly if the shot pattern is left of the bulls-eye. Likewise, move it left if the pattern is to the right of the bulls-eye. Adjust your rifle sight screws incrementally until the shot pattern or "X" lands inside the bulls-eye of the target. Re-tighten the screws as your rifle is now properly sighted. New England native Bryan Gray began writing in 2009. His articles appear on eHow, with a focus on home improvement. Now working in home construction, Gray spent a majority of his career in health care as a surgical technologist. He holds a Bachelor of Arts in sociology from the University of Massachusetts at Dartmouth. How do I Use a Leupold VX-3 Scope?